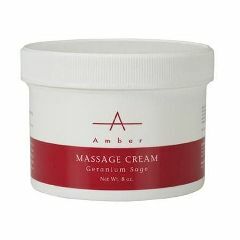 Amber Geranium Sage Massage Cream is a unique blend of egyptian geranium to calm, white sage to purify and detoxify, and lime for its antibacterial properties. This non-greasy formulation of the Amber Geranium Sage Massage Cream leaves skin hydrated and soft. It features rich, heavy textured cream base which creates an effortless glide for versatile massage techniques. The smooth glide softens the skin. The Geranium Sage scent contains a delicate aroma of egyptian geranium, spanish sage, and lime essential oils combined to create a clean, peaceful scent. Available in 8 oz, 32 oz and 1 gal container.